The Dance-Technology Zone is currently in transition. During the next few months, we're reviewing and updating content, as well as creating a whole new site structure to hold it all. While we are under construction, content on this site will not be actively maintained, so it is now essentially an archive. The new site will be located at dancetechnology.org (or dot-com). It will combine material from the DTZ with the archives of the dance-tech list as well as new material. For more information, or to offer suggestions, contact me at scott@dancetechnology.com. 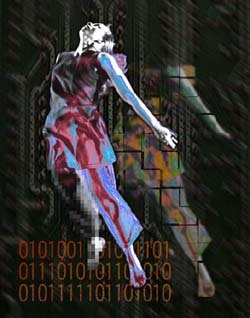 The Dance & Technology Zone (DTZ) is a resource for artists and others who are particularly interested in using new media and information technologies in the creation and performance of dance, dance theater and related live performance works. Creation and maintenance of this site was the result of an ongoing collaborative project of Troika Ranch (New York) and Writing Research Associates (Amsterdam.). It is now being maintained and developed by Scott Sutherland.